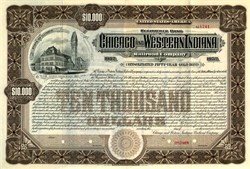 Beautifully engraved Specimen Gold Bond certificate from Chicago and Western Indiana Railroad Company printed in 1902. 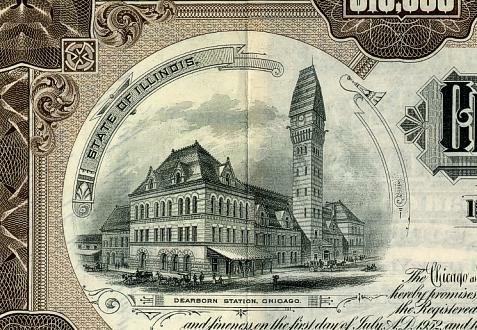 This historic document was printed by Western Bank Note Company and has an ornate border around it with a vignette of a Dearborn Station in Chicago. This item is over 104 years old. The Chicago and Western Indiana Railroad (AAR reporting mark CWI) was the owner of Dearborn Station in Chicago and the trackage leading to it. It was owned equally by five of the railroads using it to reach the terminal, and kept those companies from needing their own lines into the city. History - The C&WI was chartered June 5, 1879, and soon opened a line in May 1880 from Dolton, where the Chicago and Eastern Illinois Railroad merged with the Columbus, Chicago and Indiana Central Railway (PRR Panhandle Line), north to its new station at Polk and Dearborn Streets on the south side of the Chicago Loop. The alignment ran north from Dolton to the crossing of the Illinois Central Railroad just south of its junction with the Michigan Central Railroad at Kensington, then continued northwest and north, eventually coming along the west side of the Pittsburgh, Fort Wayne and Chicago Railway (PRR) at 47th Street. Then it continued north to cross the PFW&C and head northeast at Alton Junction, crossing the St. Charles Air Line Railroad and Chicago, Rock Island and Pacific Railway before turning back north the rest of the way to Dearborn Station. Connections were immediately provided with the newly-built Wabash, St. Louis and Pacific Railway at 74th Street and Chicago and Grand Trunk Railway (GTW) at 49th Street, which, along with the Chicago and Eastern Illinois Railroad connection at the south end at Dolton, were the three initial lessees of the line. Soon after, the Chicago and Western Indiana Belt Railway and South Chicago and Western Indiana Railroad were merged into the C&WI on January 26, 1882. Several more lines were built using their charters - a branch from the main line at 74th Street, west and north to the Chicago, Milwaukee and St. Paul Railway at Cragin, a branch from 87th Street east to various connections at South Chicago, and a branch of that line from Pullman Junction south and southeast, parallel to and east of the New York, Chicago and St. Louis Railway, to just shy of State Line Junction in Hammond, Indiana. At Hammond two more connections were made - the Chicago, Indianapolis and Louisville Railway (Monon) and the Chicago and Atlantic Railway (Erie). Those two companies also acquired shares in the C&WI, bringing the total to five. The State Line and Indiana City Railroad later gave the Wabash, St. Louis and Pacific Railway a second access point to the C&WI at Hammond, and a sixth railroad - the Atchison, Topeka and Santa Fe Railway - used Dearborn Station, but used its own line on the east side of the C&EI from Alton Junction to the station. The branches to Cragin and South Chicago (the latter east of Hammond Junction only) were leased in 1883 to the newly-formed Belt Railway of Chicago, which was also given trackage rights over the C&WI's main line and branch to Hammond Junction. The C&WI continued to operate its main line from Dearborn Station south to 87th Street, where it split into two lines to Dolton and Hammond. Dearborn Station closed in 1971. The old C&WI from Alton Junction to 74th Street is now owned by Metra and used by their SouthWest Service, switching to the line to Union Station at Alton Junction and to the old Wabash Railway line at 74th Street. From 87th Street to Dolton, the line is now owned by the Union Pacific Railroad, which also has the former Chicago and Eastern Illinois Railroad south from Dolton. The rest has been abandoned, except for a short piece north of Hegewisch, now used by the Chicago Rail Link, and the part used by the Belt Railway of Chicago, now owned by the BRC.